While LEGO has been around for as long as anyone can remember, the products coming out of the Danish company have evolved over the years. It was 40 years ago that things changed for the beloved brick based construction brand, as the template for LEGO sets as we know them today was established. In 1978, the minifigure was introduced along with LEGO building kits that were designed to scale with the little characters and packed with play value. 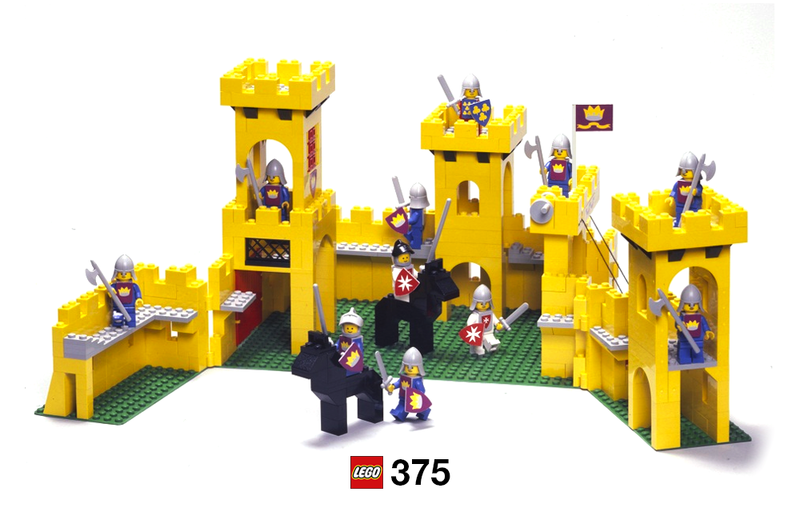 One of the sets that stands out from that year, that kick-started an entire LEGO theme, was called ‘Castle’ – also known by set number 375. The colour palette was more limited at the time, so rather than realistic greys and blacks, this first ever castle is built using yellow bricks. The set was cleverly designed with hinge pieces combining multiple bases, allowing it to fully open up for plenty of play options. It even incorporated a working drawbridge, a feature that would be included in many more LEGO castles over the years. The 14 included minifigures all feature the classic smiley face, with bespoke accessory elements, especially for the knights. Two types of helmets, axes, swords, and shields were all developed just for this product. Unlike modern minifigures, the knights all had plain torsos – so breast place pieces were included with stickers to decorate them with. Although minifigures had been introduced, sculpted animals were still not on the agenda, so the horses in 375 Castle are all brick built. Daniel August Krentz, the designer who worked on the model, had provided the foundation for what would become an entire LEGO world. Things really moved up a notch in 1984, when castles were released in a more realistic grey, along with carts, catapults, and towers. Rather than build a single castle, children could create an entire world of knights, towers, and adventure. Today, 375 Castle is often referred to as the ‘yellow castle,’ because of that distinctive choice of colour. Although it might lack authenticity for that choice, it makes it one of the best-remembered sets, standing out in the LEGO back catalogue. For the past few years, there has not been a LEGO Castle range on the shelves. Instead, children have been engaged with NEXO KNIGHTS – a fusion of futuristic technology with medieval adventure tropes. Times may have changed, but the legacy of that original Castle set continues. Perhaps foretelling of an eco-friendly future, Kenner released the Zippity Speedway in 1968. The game's toy cars were propelled by air! With a player experience that clearly pays homage to B-grade horror films of the 1950s, Ideal’s Tiger Island game makes me wish I had been privy to the conversations of the product design team that released it back in 1966.